Beyond Monumental, the 501(c)3 non-profit responsible for the CNO Financial Indianapolis Monumental Marathon has announced a new partnership with Circle City Kombucha. Circle City Kombucha will have a presence at the Indy Half Marathon at Fort Ben and the Monumental Mile, as well as engaging with participants at other community-centered events hosted by Beyond Monumental throughout the year. 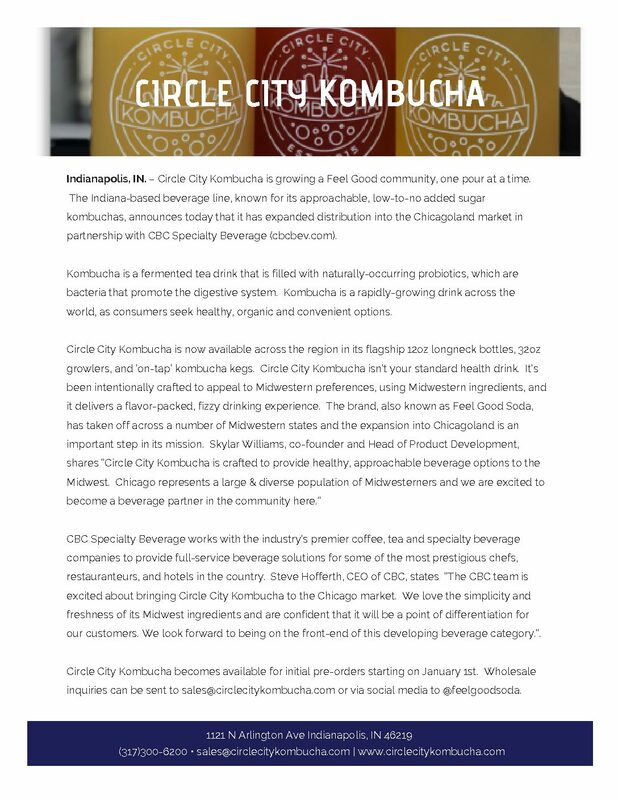 Circle City Kombucha was founded in 2015 and prides themselves in going beyond the usual health drink. Their Kombucha is intentionally crafted to appeal to Midwestern preferences, using Midwestern ingredients, and delivers a flavor-packed, fizzy drinking experience. You can find Circle city Kombucha at your local grocery stores, restaurants, concerts, farmer’s markets, and many more places. A full list is available online. “We’re excited to partner with a local company that wants to engage with our participants and will be an added benefit in our post-race experience,” said Jed Cornforth, Executive Director of Beyond Monumental. Beyond Monumental continues to partner with both national and local companies. Title sponsor CNO Financial Group has renewed their partnership through 2020, and presenting sponsors Franciscan Health and Apex Benefits continue their multi-year presence. Other sponsors include Athletic Annex, Aquafina, Clif Bar Baking Co., Marathon Petroleum, Taylor’s Bakery, Tru Moo Milk and White Claw Hard Seltzer. Registration for the Monumental Mile (June 7), Indy Half Marathon at Fort Ben (October 5) and CNO Financial Indianapolis Monumental Marathon (November 9) is open and available online at beyondmonumental.org.